A good backyard landscape design will create a series of outdoor spaces that serve different functions, whether you want to play, relax, entertain, or just enjoy your outdoor space on a nice day. A well-designed landscape complements a home's design and architecture by extending the home’s interior design style outdoors; making your patio, deck, or balcony feel like another room of the house. 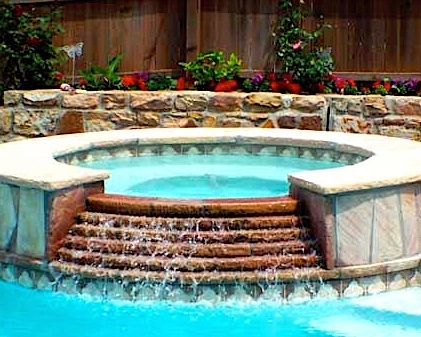 Choose a style and theme for your backyard (Traditional, Tropical, Tuscan, Modern, English, Japanese, Country, French, Cape Cod, colonial, Spanish, or Coastal). Use a color scheme that matches your house indoor color scheme. 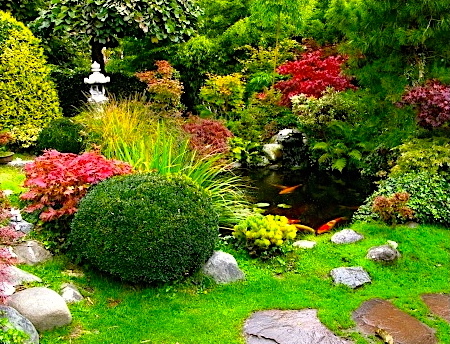 Create a focal point for your backyard landscape design. Garden fountains, ponds, pools, sculptures, birdbaths, flower arrangements, or interesting trees make good focal points in a landscape design. Incorporate hardscapes into your design. Using the same material for all your hardscapes (pathways, patios, retaining walls) will add visual appeal to your landscape design. Add a stepping Stone Pathway. Sandstone, flagstone, and bluestone are great options for a pathway. Add a fire pit to add warmth to your outdoor space in late summer and early fall. Select outdoor furniture that matches the style of your home. Metal and glass furniture goes well with contemporary homes. Iron, wicker, and wood furniture goes well with traditional style homes. Add a garden swing or a bench if your outdoor space allows. These accessories will add a relaxing feeling to your outdoor space. 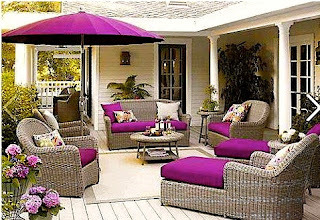 Design your outdoor seating area like your indoor living room by arranging your outdoor furniture to make conversation easy. Add an outdoor dinning set for barbecues and summer dinner parties. Create outdoor privacy by using shrubs, trees, and fences. 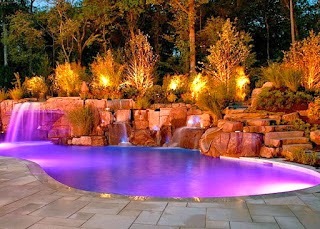 Add stylish outdoor lights to set the mood, to enhance your backyard design, and to provide safety at night. 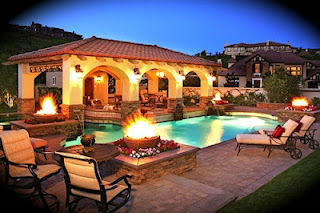 Use backyard torches to add elegance to your outdoor space. Add citronella candles to enhance the mood at night and to keep the mosquitoes away. Add shrubs, plants and flowers (perennial and annual) of varying colors and types to provide visual interest throughout the year. Color and form variation are a key element of any landscape design. 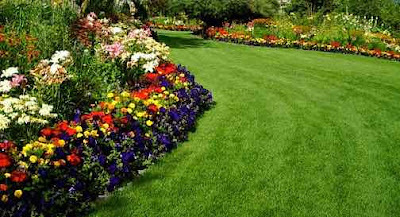 Create transition layers in your planting beds buy designing your plant beds in rows of three. Use Hanging planters to easily add color to your outdoor space. Designate a separate play area for the kids. Use the principles and the elements of landscape design in addition to the tips in this article to create an esthetically pleasing backyard space that will also add value to your home.